PanARMENIAN.Net - Venezuela's first lady on Tuesday, January 12 broke her silence on the arrest of her two nephews on drug trafficking charges, saying they were kidnapped by the U.S. Drug Enforcement Administration, according to the Associated Press. 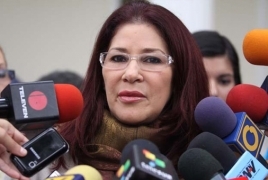 Cilia Flores, who serves in congress, told Venezuelan weekly Tal Cual that the U.S. was seeking revenge and trying to force the socialists from power in the South American country. She said the government had proof that the DEA had conducted an illegal operation on Venezuelan soil and "violated our sovereignty." Two of Flores' nephews were arrested in November in Haiti and transferred to New York. They are being held on charges of conspiring to smuggle cocaine into the U.S.
"The DEA committed the crime of kidnapping," Flores said. U.S prosecutors have investigated several top Venezuelan officials for drug charges, but November's arrests marked the first time President Nicolas Maduro's inner circle was directly implicated. Flores had refrained from addressing the case. But that's been increasingly hard to do after the opposition won control of congress and allowed reporters to enter the congressional chamber for the first time in years. Last week, Flores was filmed ignoring direct questions from reporters on the topic, which local press has dubbed the "narconephews" scandal.